Description A montage of five small black and white photographs showing, from left to right, a cat lying in a headless female's lap; a garden path, borders of flowers, netted tree trunk, shed, cabbage/palm trees, a house, with other houses in the background and up the hill; cat lying on a raised surface which could be a rug or spread of some kind on a table, bed, or sofa; a second view of the same garden with the path, flower borders and netted tree trunk, with a lady and child standing in the path beside a watering hose; a tall, narrow, spired wooden structure at the end of a wooden walkway branching over an unknown space, possibly over water but foliage is growing in it. Two people stand looking over the railing, there are large spruce type trees in the background. A note on the reverse reads: "Photography - Mr. Chinn". 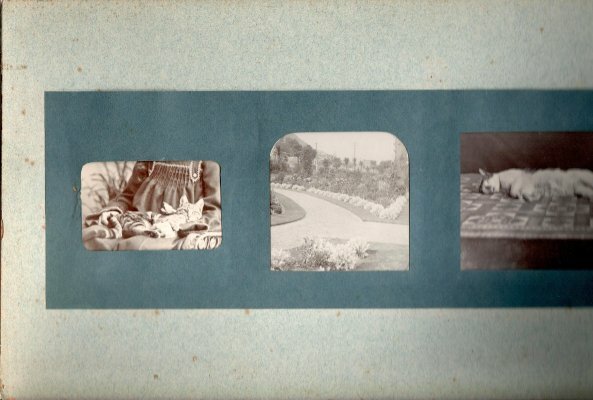 The montage appears to have been compiled by an artist - the shapes around the pictures are artistic and the headless lady is not a normal view but consistent with the cats being more important than their resting places - so it was probably put together by Mr. Chinn. In 1906: "Mr. Chinn is a member of the Marlborough Agricultural and Pastoral Association, takes a keen interest in horticultural matters, and has some fine conservatories and gardens at his private residence in Grove Road." [Source: Cyclopedia of New Zealand Volume 5, 1906, p341]. Because Mr. Chinn had "conservatories and gardens .... in Grove Road", it was felt the gardens shown might be his. Ralph Ballinger of North Street in 2009, but of Budge Street in the 1940s and 1950s, in a similar area to Mr. Chinn, was asked to look at the montage, but he came to the conclusion that overall the trees are too mature and the houses and hill look wrong for the area. Also, the wooden structure is not one he recognised and he and I both felt, even if it was long gone, it would not be something that would be forgotten. The conclusion was that the garden views on their own are not of Grove Road and the garden views including the wooden structure are most definitely not Grove Road. We felt the wooden structure might be in Rotorua or the botanical gardens in Christchurch. 1 September 2009: On checking with the volunteers in Archives today the overall consensus was that the wooden structure was definitely at Karori Reservoir in Wellington, but no-one knew where the gardens were. 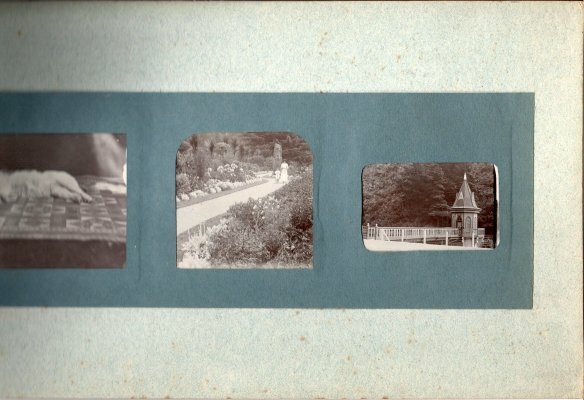 Possibly they were the Karori Reserve gardens at the time this photograph was taken. Found in a long envelope with "J. Chinn Photography" written on it in the Museum workroom research shelves on 25 August 2009 by Jenny Pierson. See related for where the gardens are and other, related images (Jenny Pierson, 4 May 2013.